Sentinel-2B, Europe´s next Copernicus satellite, is being readied by engineers from Airbus for a March 7, 2017, lift-off from Kourou, French Guiana. Sentinel-2B will be the fifth satellite of Europe’s Copernicus environmental monitoring program to be launched. Copernicus is an operational program led by the European Commission (EC) in partnership with the European Space Agency (ESA). The Copernicus Sentinels supply remote sensing data of the Earth to deliver key operational services related to environment and security. 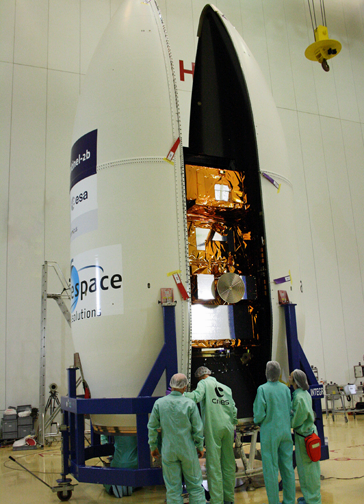 The Sentinel-2B satellite within the launch vehicle's fairing. 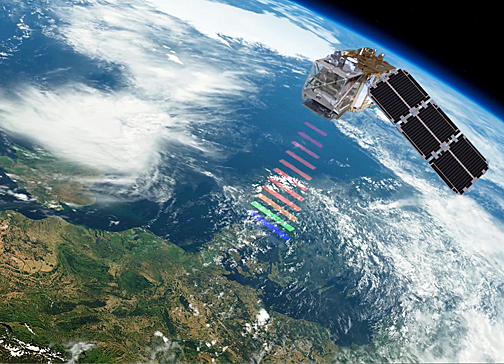 Offering ‘color vision’ for the Copernicus program, Sentinel-2 delivers optical images from the visible to short-wave infrared range of the electromagnetic spectrum. From an altitude of 786 kilometers, the 1.1 ton satellites provide images in 13 spectral bands with a resolution of 10, 20 or 60 meters and a uniquely large swath width of 290 km. The optical design of the Multi Spectral Instruments (MSI) has been optimized to achieve state-of-the-art imaging quality across its very wide field of view. The telescope structures and the mirrors are made of silicon carbide, which provides very high optical stability and minimizes any thermo-elastic deformation to give an excellent geometric image which is unprecedented in this category of optical imagers. The data gathered are used for monitoring land use and changes, soil sealing, land management, agriculture, forestry, natural disasters (floods, forest fires, landslides, erosion) and to assist humanitarian aid missions. Environmental observation in coastal areas likewise forms part of these activities, as does glacier, ice and snow monitoring. The Sentinel-2 mission is based on a constellation of two identical satellites in the same orbit, 180° apart for optimal coverage and data delivery. The satellites are orbiting the Earth every 100 minutes covering all Earth’s land surfaces, large islands,inland and coastal waters every five days. Sentinel-2A, which is identical in design, was launched on June 23, 2015. The Sentinel-2 mission has been made possible thanks to the close collaboration between ESA, the European Commission, industry, service providers and data users. Its development has involved more than 40 companies, led by Airbus in Germany for the satellites and Airbus in France for the multispectral instruments, while Airbus in Spain is responsible for the mechanical satellite structure. Artistic rendition of the Sentinel-2B satellite on orbit. The mission has been supported by the French space agency CNES to provide expertise in image processing and calibration, and by the German Aerospace Center DLR that provided the laser communication payload, developed by Tesat Spacecom, a subsidiary of Airbus in Germany. This piece of technology allows the Sentinel-2 satellites to transmit data via laser to satellites in geostationary orbit carrying the European Data Relay System (EDRS) developed by Airbus for ESA. This SpaceDataHighway allows large volumes of data to be relayed very quickly so that information can be even more readily available for users. As of February 2017, a total of 63,981users self-registered on the Sentinels Scientific Data Hub. About 484,000 products are available for download, with a total volume of 585 TB. Overall, a total volume of 2.74 petabytes has been downloaded by the user communities.